Taxes: Not Fun to Pay, but Great Genealogy Records! Tax Day in the United States is quickly approaching. Are you ready? Taxes are a part of our everyday modern lives from sales tax and income tax to property tax. As we approach that dreaded date in April when our annual income tax returns are due, it’s a good reminder that we can look at our ancestor’s tax records to help with our genealogy research. Document: 1941 Pennsylvania tax notice. Credit: from the author’s collection. Have you thought about the newspaper as a place to research your ancestor’s tax records? 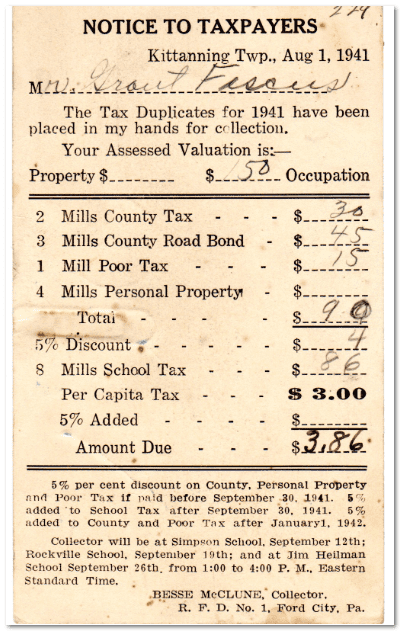 Our ancestors were similarly saddled with all types of taxes as we are today, and some taxpayers found themselves mentioned in the newspapers in the form of annual delinquent property tax lists. 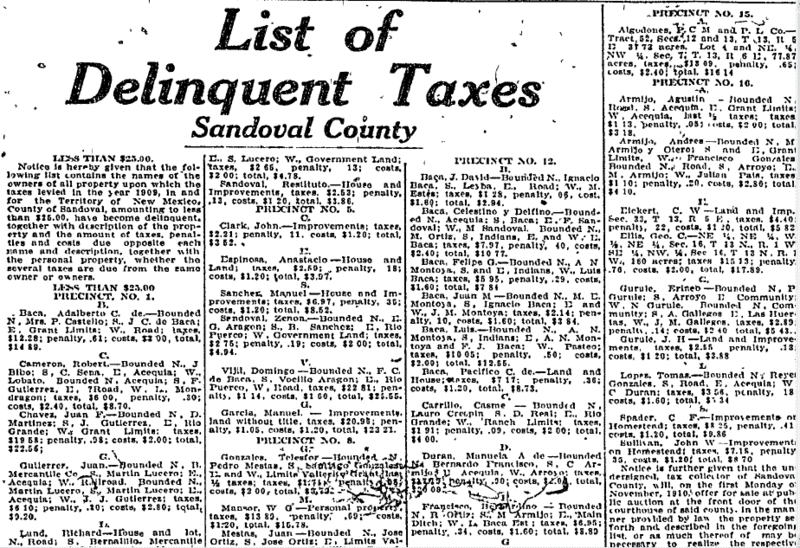 For example, in this 1910 list of delinquent tax payers in Sandoval County, New Mexico, the names of the property owners, the amount due, and the property descriptions are all provided. For those who could not or would not pay their outstanding property tax balances, a sale of their property would occur. That information would also be published in the newspaper and might include the property owner’s name and property description, as shown in this example from California. 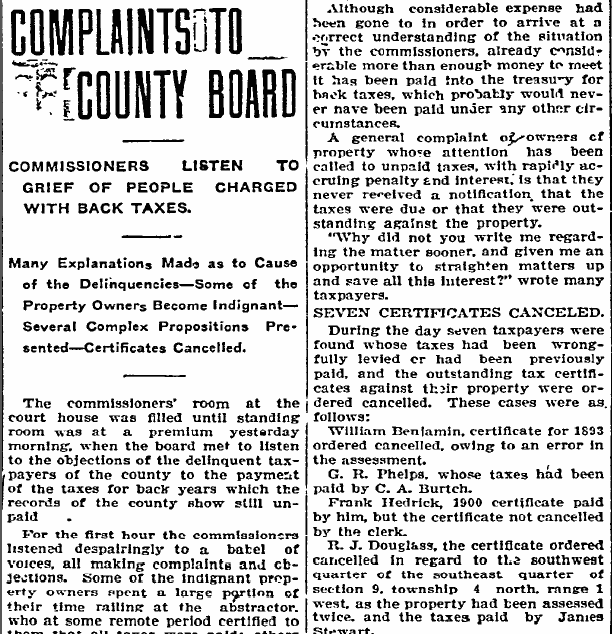 Here is an old article from an Idaho newspaper about taxpayer complaints to the county board. It provides good information about a few taxpayers, why their taxes weren’t paid or weren’t credited by the tax collector, and the result of their complaints. In one case a man who was ill with smallpox asked to have any penalties for non-payment dropped because he was quarantined and not allowed by county officials to visit anyone. While it seems like that would be a good enough excuse, it appears his request fell on deaf ears. Several women were exempted from paying taxes because they were widows. Details including names and circumstances of seven taxpayers can be found at the end of the old newspaper article. Other types of newspaper articles provide information about new taxes being enacted. These historical news articles can give you a sense of what life was like for your ancestor. While this type of social history background is not specific to an individual’s name, it does provide an understanding of their lives. All types of tax records and notices are available on our ancestors. One of my favorites, the dog tax that was assessed against owners, was adopted by communities to help individuals who suffered the loss of livestock because of roving dogs. When researching taxes your ancestor may have paid, if you haven’t done so already, I recommend that you first check the Family History Library Catalog and conduct a Place Name search on where your ancestor lived. While conducting a place search you can look over records in the subject category “Taxation” for documents that can provide some information about your ancestor’s life. Between these tax records, and the information published in old newspapers, you might be able to fill in a few missing pieces in your family history! 23 Million Newspaper Records for all 50 U.S. States Just Added! Thank you for this great tip. 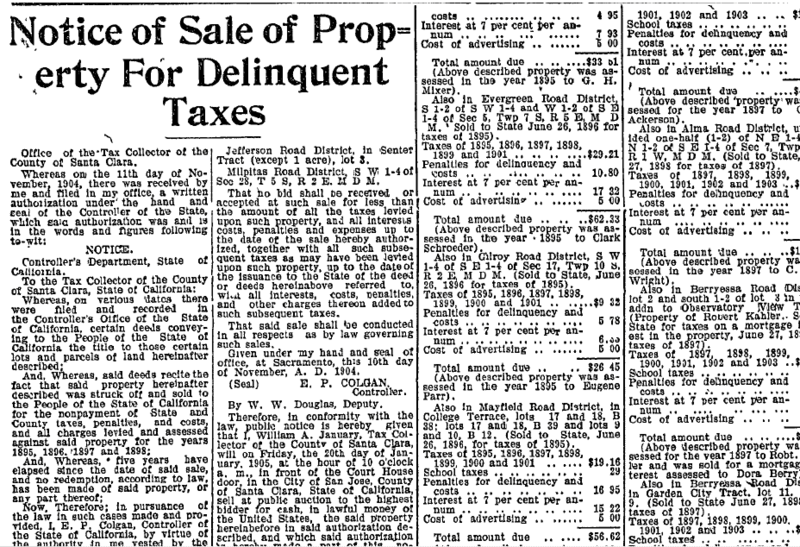 This is a completely new idea to me — ancestors and delinquent taxes, plus new taxes enacted — all in the newspapers. I’ve copied the URL for the Family History Library Catalog and will do a search by city, county, or whatever they have! They are a great resource for placing an ancestor in a specific place in time. One of my favorite tax finds was a 4th great grandmother who died shortly after paying her taxes. Her name on the tax roll helped us determine when she died.